Justin Tse: The shooting in Ottawa on 22 October 2014 has uncovered the remarkable way that the Canadian state remains theologically constituted. In some ways, this is a relatively uncontroversial argument. The White House press conference immediately following the attacks made a link between the Canadian support for military action against the Islamic State and the deaths of both Warrant Officer Patrice Vincent on October 20 in Quebec and Cpl. Nathan Cirillo of the Argyll and Sutherland Highlanders on the October 22. When one says that Ottawa shootings have a religious dimension, the gut response is that my argument will be about Muslims in Canada and the potential for radicalization. However, I am less interested in the link to the Islamic State and more interested in the ways that the putatively secular, multicultural Canadian state is doing theology in this moment. The chatter in the public sphere has mostly revolved around Pierre Elliot Trudeau’s invocation of the War Measures Act in 1970, especially because the alleged shooter was Québecois. The last time in recent memory that this sort of panic happened in Ottawa, it was because the Front du libération du Québec (FLQ) kidnapped the British Trade Commissioner, James Cross, and the Quebec Labour Minister, Pierre Laporte. Trudeau’s response at the time was to meet ideology with ideology. If the FLQ adopted a Marxist ideology to denounce the embeddedness of the Canadian political economy with elite American power and to call for a new Quebecois political sovereignty, Trudeau criminalized them and argued that they represented “the emergence of a parallel power which defies the elected power in the country” that “must be stopped.” Both the FLQ and Trudeau articulated their political positions in secular ideological terms. The responses from the official party leaders have revealed that these state ideologies have always been theological. Prime Minister Stephen Harper framed the National War Memorial where the shooting occurred as ‘a sacred place that pays tribute to those who gave their lives so that we can live in a free, democratic and safe society’ and also sent his ‘thoughts and prayers’ with Patrice Vincent. New Democratic Party Leader Tom Mulcair cast the “thoughts and prayers of everyone here in our nation’s capital” with Cirillo’s family as an act of Canadian solidarity in a society marked by ideological difference. In addition to mentioning the War Memorial as “one of our nation’s most sacred monuments,” Liberal Leader Justin Trudeau also reached out to the Muslim community to say that “acts such as these committed in the name of Islam are an aberration of your faith,” calling for “mutual respect and admiration…to prevent the influence of distorted ideological propaganda posing as religion.” While the debates among these party leaders has been fierce in the past, they demonstrated that they represent three strands of the same Canadian state theology: bound by our solidarity in times of war, the coming together of Canadians of all political and ideological stripes is a sacralized bond. What the Ottawa shootings have done, then, is to suggest a way forward in the study of Canadian religion. While Jamie Scott’s The Religions of Canadians posits an intriguing suggestion that there is an overarching Canadian religion, he organizes the book by looking at the individual religious traditions at work in Canada. But the aftermath of the shooting makes one wonder whether the schematic to use for Canadian religious studies might follow ideological lines. After all, one might ask: who is left out of those sacralized Canadian bonds? That Trudeau felt that he had to reach out to the Muslim community suggests that Muslims in Canada have been framed as a perpetual other. Despite the repeal of the War Measures Act by the Emergencies Act of 1982, the invocation of the memory of the War Measures Act in 1970 should remind Canadians of the internment of Ukrainian Canadians in the First World War and of Japanese Canadians in the Second. That it has been revealed that the shooter had a criminal record in Quebec and British Columbia and was a drug addict should remind us of the class differences that engender new ideologies and political theologies. In other words, perhaps Canadian religion is not simply about the mosaic of cultural traditions that make up the tapestry of multiculturalism. Perhaps it is about the competing, yet mutually constitutive, ideologies that seek to define Canadian political theology. Matt Sheedy: While yesterday’s shooting in Ottawa was not the first incident of aggression directed against representatives of the state in Canadian history, it was unique for a variety of reasons, mostly notably in its connection with “home grown terrorism,” “ISIS,” and “Islam,” marking the second such attack of this kind in so many days that resulted in the death of a uniformed officer. * On October 20, 2014, Martin Couture-Rouleau, 25, ran over two men outside of Montreal, one of whom, uniformed Warrant Officer Patrice Vincent, 53, was killed, while Couture-Rouleau was later shot dead by police after a high speed car chase. 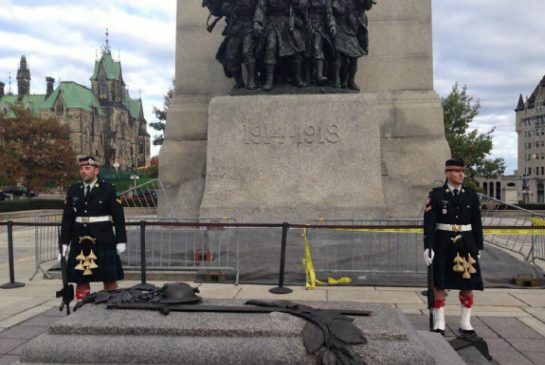 * On October 22, 2014, Michael Zehaf-Bibeau, 32, shot a uniformed officer, Nathan Cirillo, 24, in front of the National War Memorial on Parliament Hill in Ottawa, (Canada’s equivalent to the White House) who later died in hospital. He then stormed parliament and was shot in a hail of gunfire, which was caught on camera by a reporter and played repeatedly in a loop throughout the day. * Both attackers were young men who were being monitored by authorities; Couture-Rouleau had his passport taken along with 89 others on a watch-list of radicalized youth who the government had flagged as “high-risk travellers” for fear that they would commit crimes abroad; Zehaf-Bibeau was trying to obtain a passport with apparent intentions to travel to Libya. * Both young men were recent converts to Islam and were reported to have followed radical groups on-line, including ISIS spokesperson Muhammad Al-Adnani. * Many members of parliament, including the Prime Minister and leaders of opposition parties were in session very close to where the shooting took place and were barricaded behind doors for upwards of 9 hours during the chaos. There have been reports that during this time members of parliament broke as many as 15 flags poles and fashioned them into spears while the Prime Minister hid in a closest. An event such as this brings forth waves of emotion and heightened rhetoric, which is always conditioned in subtle and not-so-subtle ways by prior events and filtered through familiar narratives that attempt to explain what, precisely, has just occurred and why. While displays of nationalism and calls for retribution are to be expected in moments of crisis, the social effects of such discourse are always complex and hard to predict, not least because of the uncertainty surrounding possible future attacks, which, in turn, lead to calls for increased security, surveillance, and even the curtailment of civil liberties. In short, it is the stuff that fear, mistrust, and heightened rhetoric is made of. For Derrida, what was most important to think about in the chaotic aftermath of such an event was how its traumatic effects were produced through what he called a “repetition compulsion” of images and ideas—“terrorism,” “9/11,” “radical Islam”—which mediate not only our understanding of what is at stake and thus narrow the terms of debate, but also contain and repress other possibilities or “iterations” by virtue of their symbolic power to give a name to what has taken place. For those like myself who are interested in thinking about such events as a scholar of religion, one important dimension that will require close attention is how “Islam”–as a generalized concept and as a symbol that is drawn upon to describe peoples’ identities and as a cause or motivation for violent retribution–is re-produced through this “repetition compulsion” of old and new symbols coming together in different chains of signification. While there has been much praise from US media at how well the “Canadian” press (referring to CBC news anchor Peter Mansbridge) covered the chaos that unfolded in Ottawa, as well as praise for Liberal Party leader Justin Trudeau’s response at a press conference following these events, this is not only an incomplete picture of mainstream responses, but also one that tends to obscure the ideologies at work in these (admittedly) more measured replies. More sensational rhetoric can be found in “home-grown” media such as Sun TV, which rejected narratives about the confirmed mental illness of these men as “political correctness” in favor of a discourse that places “Islam” at the root cause of their motivation. For example, among several programs featured over the last few days on Sun TV include an interview with Jihad Watch’s Robert Spenser and Dutch politician Geert Wilders, both of whom are well-known for their inflammatory anti-Muslim rhetoric. One challenge for scholars of religion … is to avoid the temptation to play into the logic of this framework, which sets up a dichotomy between “good” and “bad” Muslims … and describes complex identities through the prism of better and worse expressions of “Islamic belief,” and focus instead on the ways in which “Islam” is taken up and re-produced differently in the material world and in contexts of human interaction. The current discourse in Canada is very much guided by this binary logic and thus needs to be carefully thought through and analyzed, including the ways that “Islam” functions as a counter-narrative or reply to tepid discourses about multiculturalism, toleration, and “true Islam,” which, as Justin Tse points out above, are conditioned (among other things) by state theologies and the interests that guide them. The seeming inability to link causation to things like Canada’s participation in foreign wars over the last 13 years that have been narrated, to varying degrees, as a “clash of civilizations,” suggests that “Islam” will continue to function as a primary causal factor for some (e.g., “they hate us for our values and freedoms”), and an alibi for others (e.g., these are not true Muslims) rather than as an important and indeterminate variable that must be treated with the nuance it deserves. This entry was posted in Matt Sheedy, Politics and Religion, Religion and Society, Religion and Theory, Theory and Method, Uncategorized and tagged Giovana Boradorri, Jacques Derrida, Jamie Scott, Justin Trudeau, Martin Couture-Rouleau, Michael Zehaf-Bibeau, Muhammad Al-Adnani, Nathan Cirllo, Patrice Vincent, Stephen Harper, Tom Mulcair. Bookmark the permalink.